My Entertainer of the Year 2008, singer/actor Jeff Trachta is my idea of the ideal night club performer. He is a fantastic singer, impressionist and one helluva funny man. His one-man show Jeff Trachta Live! 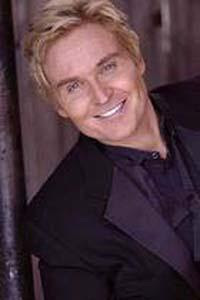 plays the Spa Resort Casino in Palm Springs Fridays and Saturdays at 7pm in the Cascade Room. An alumnus of The Bold and the Beautiful, having played Thorne Forrester for 8 years, and Broadway as Danny Zuko in Tommy Tune’s acclaimed revival of Grease (mid 1990s), Jeff Trachta is at present happy to perform alone, except on occasion with his pet golden retriever who recently accompanied him to the Cascade Room. In our interview, Trachta talks about his idols and his newfound love of PS. Q: How do you like working the Cascade Room in PS as opposed to performing in Las Vegas? JT: I love living in Palm Springs so much. It's one of the most beautiful places on Earth.The spectacular mountains.The weather. The people. To be able to work and have a life here is perfect. Q: Someone asked, "Do you think he'd go back to Broadway?" How about it? For the right role? JT: Right now I am completely fulfilled doing my own show.I like the total creative control and the give-and-take I get with my audiences. I wouldn't want to do anything other than what I'm doing right now and in the venue I'm doing it. Q: You bring the audience such joy when you perform. Is this your greatest high? If not, what is? JT: I love crack actually (Kidding).I must admit performing in front of a live audience is right up there. Although I also love being close to nature. I enjoy hiking those mountains I mentioned earlier, and I really get a lift from animals and their honest energy. Q: Who are your singing idols? JT: I love Nat King Cole, Frank Sinatra, Tony Bennett. I'm also a huge fan of Boz Scaggs, Bon Jovi and Barry Manilow, not only as a singer but also as a songwriter and arranger. Q: And your acting idols? JT: Danny Kaye, Jim Carrey, and Kevin Spacey are all amazing. Q: Which contemporary ones are appealing to you? How do you really feel about Justin Timberlake? JT: I think Justin Timberlake is incredibly talented. I also love Usher and Gnarls Barkley. Q: Is it nice to be away from LA, or would you bring the show back here sometime? JT: Palm Springs is so laid back and has a comfortable, small-town feeling. You get very spoiled here. Q: What is your mission as a performer? JT: To put the audience in a great mood. It's that simple. JT: I'm not really pursuing any other opportunities. I love where I am right now. But I'm planning on living to 114, so I have a few more years to create new things. Like George Burns, Trachta envisions a long life. I do as well. In 2o years time, Jeff Trachta Live! will still undoubtedly be one of the world's funniest & most popular night club shows.